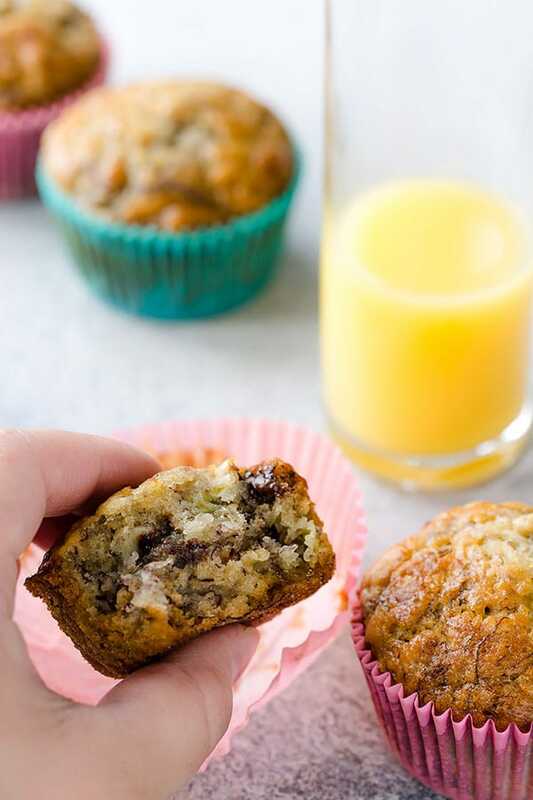 Everyone’s favorite banana bread in a muffin form! 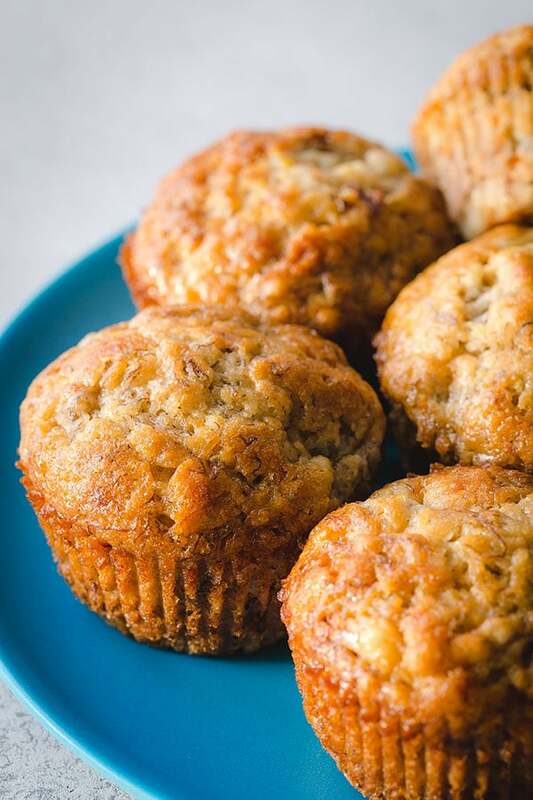 Soft and tender banana muffins with delicate moist crumbs and full of banana flavor! Simple one-bowl muffins in less than 30 minutes! You’ll enjoy the same delicious flavors of my popular banana bread, but in a small portable size. If you have a toddler, like I do, muffins are always the best choice. Am I right? 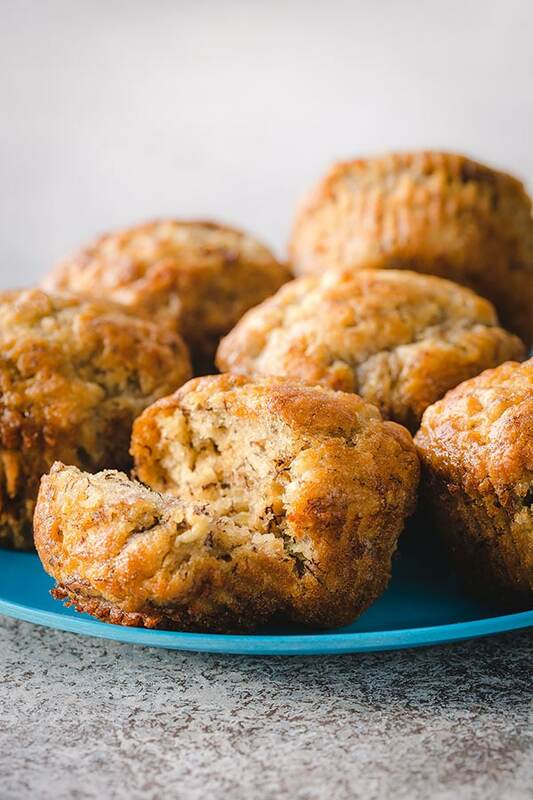 Note that my banana muffin recipe doesn’t call for any liquids, but it does produce soft and tender muffins with light delicate texture all thanks to frozen bananas. Yes, frozen ripe bananas are the secret to the best banana muffins and breads. When you defrost them, you’ll get mashed bananas with lots of flavorful liquid. That’s gold!! So next time you have ripe bananas with dark black spots laying on your counter, throw them into the freezer. And then enjoy delicious banana muffins (or bread) later. I love adding toasted walnuts in my banana muffins for added texture. However, Grant loves it with chocolate chips. Naturally! So oftentimes I just add both into the batter. Simply irresistible! Everyone’s favorite banana bread in a muffin form! Soft and tender banana muffins with delicate moist crumbs and full of banana flavor! Simple one bowl muffins in less than 30 minutes! Preheat the oven to 350°F (177°C). 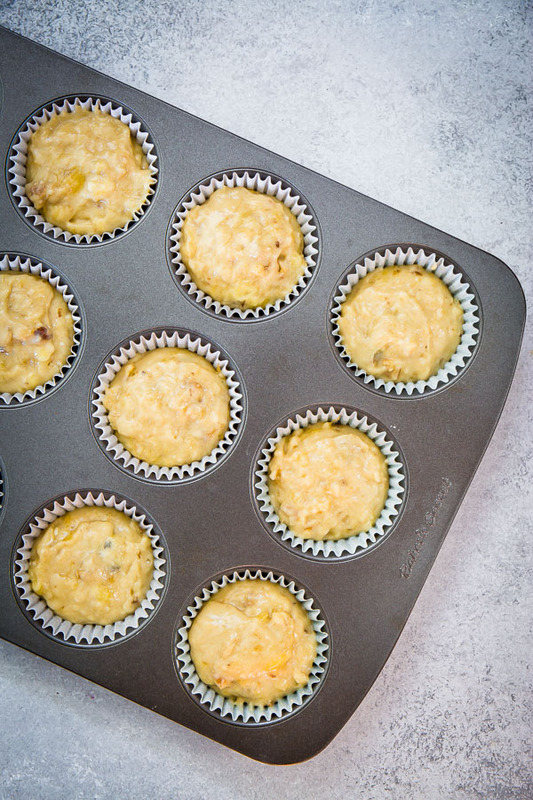 Line 12-cup muffin pan with paper liners and spray with non-stick spray. In a large bowl, mash the thawed bananas with a fork or potato masher. Add sugar, melted butter and vanilla extract, and mix everything until combined. Then add flour, baking soda and salt. Mix to combine. Add walnuts and chocolate chips, if using. Divide the batter evenly into the prepared muffin cups. Bake for 21-23 minutes, or until the inserted toothpick comes out clean. Store muffins, covered, on the counter for up to 3 days.